Last night, I decided to cook a Rotisserie Chicken for dinner. While I was cooking the one for dinner, I said, why not cook another to pick for the chicken salad tomorrow night. Mix mayo and sour cream tougher with mustard, dill weed, salt and pepper. Add in chopped chicken, celery, green onion, red onion, apples and grapes. Mix to coat. Serve with crusty bread and sliced tomatoes, if you like. This weekend was a weekend to pamper our dog, Zoe! Friday we went to one of the nations top 10 dog parks and it's here in Seattle. Zoe met a friend (Elvis) and, being a hound she had to sniff EVERYTHING!! With the "heat wave" we experienced in Seattle this past week (warmest day since October 15th, reaching 71F! 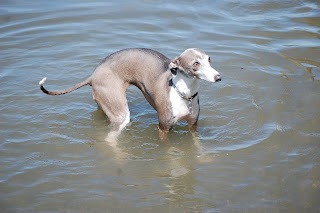 ), we ended that dog park visit with a quick trip to the water, Lake Washington. 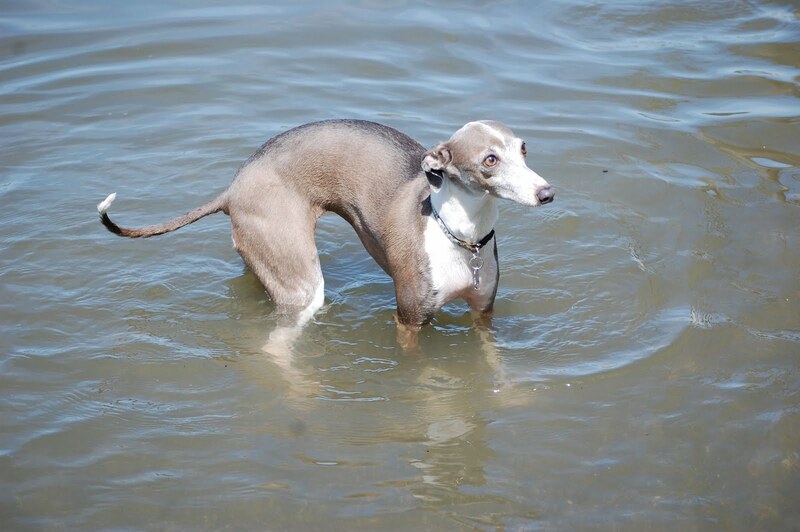 Now let me tell you, Italian Greyhounds HATE water....Zoe's first trip in the water, she quickly ran out......when I was able to get her in the water a second time, she just stood there. It actually seemed like she was finally enjoying it....although the pictures say something different. Well, today I decided to make another batch of Zoe's favorite doggy cookies. 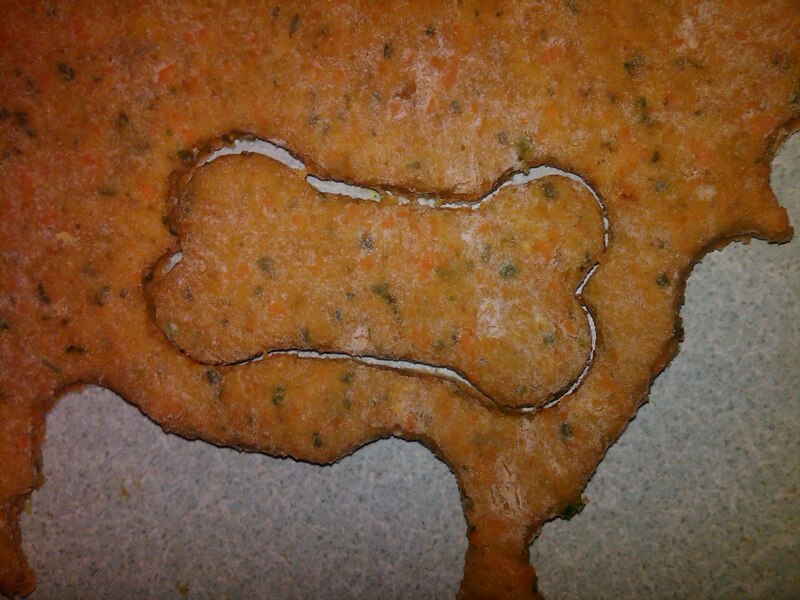 In the past I have made Chicken Liver treats, Peanut Butter Bacon cookies, and a Parsley Oatmeal treat....Today was a new mixture, Parsley Mint Carrot Spelt cookies. And let me tell you, first sampling was gone in an instant, so she had to try another. If "Man's Best Friend" is truly your best friend, then you'll spend an hour of your busy day making a special treat for your little girl, or boy. Place all of the ingredients into a food processor and pulse well. Add a little flour at a time. Roll out the dough until it’s about 1/4 inches thick. Cut the dough into cute shapes with cookie cutters or use your pizza cutter to cut into strips. Tonight I decided that I would make a few favorites in our house. 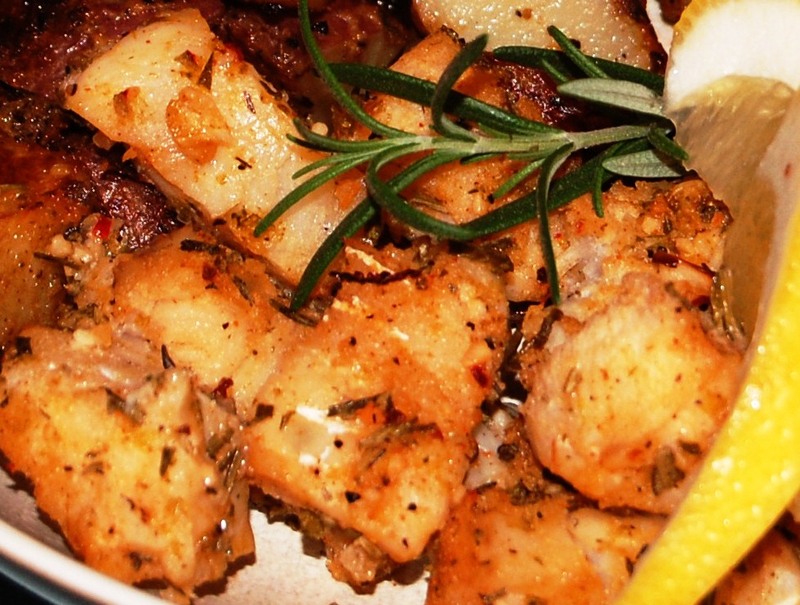 Garlic Roast Cod with Rosemary and Lemon, and Dijon Potatoes, with Whole Wheat Garlic Bread. These recipes are some of the most commented on, on both my Facebook page, and in person. A quick story about the cod, I found the recipe on Rachel Ray’s website. I originally was planning on making the recipe as is, but at the last minute changed it to use cod, a white fish I love. The next day I had a person at my new job comment on how she found this great recipe online, and could not wait to try it. I then asked what it was, she said Garlic Roasted Cod with rosemary. I was taken a bit back, and asked what the website was, she said That’s What Bob’s Cooking….I laughed, and she wanted to why I was laughing. I asked if she knew who Bob was, and then she started laughing, saying she had no idea I had a site, and that she would try the recipe and let me know what she thought of it, but it sounded GREAT. As for the potatoes, I always make a menu on Thursdays and post them on the refrigerator. I got a call from our neighbor, who was coming over for dinner and had left work early and asked if he could help with dinner. So he started the potatoes, they turned out amazing. They are my go-to side dish. As for the Whole Wheat Garlic Bread, I bought a baguette, sliced it into diagonal slices and layed them out on a sheet pan. For the garlic butter, I smashed and diced 4 cloves of garlic, and melted 1 stick of butter, then added 2 tablespoons of dried thyme. Then drizzled the butter onto each piece of bread. Broil until golden. Arrange cod in a baking dish, 9 by 13-inch. 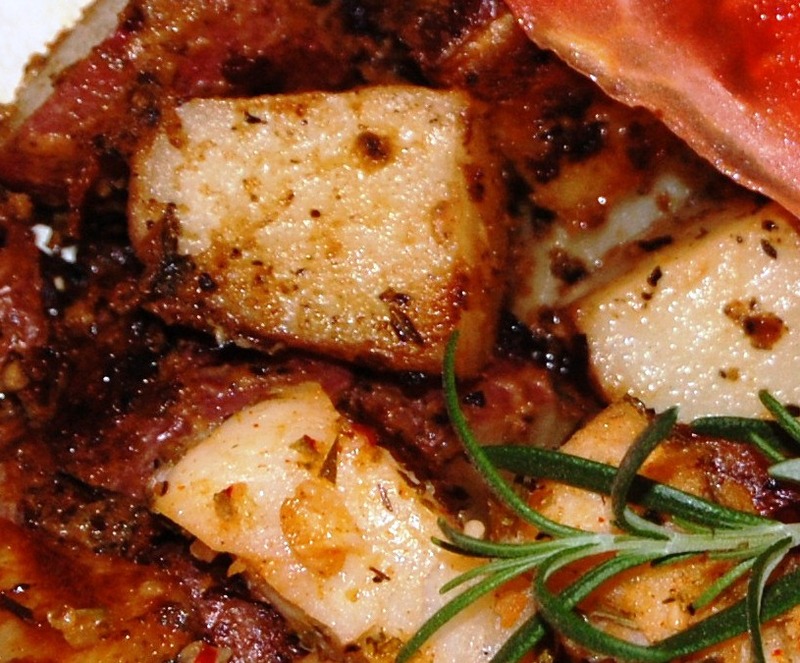 Add garlic, rosemary, extra-virgin olive oil, lemon zest and grill seasoning or salt and pepper to the dish. Toss and coat the fish with all ingredients, then place in oven. Roast 10-15 minutes. Add wine and lemon juice to the dish and combine with pan juices. Return to oven and turn oven off. Let stand 5 minutes longer then remove cod from the oven. Place baking dish on trivet and serve, spooning pan juices over the cod pieces. Coating the potatoes in Dijon mustard and a small amount of olive oil helps make them crispy on the outside and tender on the inside. Heat oven to 425 degrees F. Coat a 9 x 13-inch baking dish with cooking spray. Whisk together oil, mustard, paprika, thyme, salt and pepper in a large bowl; add potatoes and stir to coat. Transfer potatoes to baking dish and roast 15 minutes; stir and roast until tender on inside, about 15 minutes more.